Fracture of the lumbar spine can occur whenever forces applied to the lower spinal column exceed the strength and stability of the spinal column unit (see the images below). Common injuries resulting in fractures of the lumbar spine include fall from a height; motor vehicle and motor vehicle and pedestrian accidents; and penetrating trauma, including gunshot wounds and stabbings. Fractures of the pelvis often are associated with injury to the sacral plexus and the lower lumbar spine. Lumbar spine trauma. Drawing of the thoracolumbar spine viewed from an oblique frontal projection. AF indicates annulus fibrosis; DNR, dorsal nerve root; NP, nucleus pulposus; NRG, nerve root ganglion; SC, spinal cord; SN, spinal nerve; TP, transverse process; VB, vertebral body; and VNR, ventral nerve root. Lumbar spine trauma. Lateral radiograph demonstrates an L3 spinal compression fracture. Note the downward compression of the superior endplate of the L3 (yellow arrow). The anterior portion of the L3 vertebral body has been displaced forward (white arrow). Lumbar spine trauma. A 35-year-old man presented to the emergency department after a motor vehicle accident. He complained of back pain without paresthesias or weakness of his lower extremities. 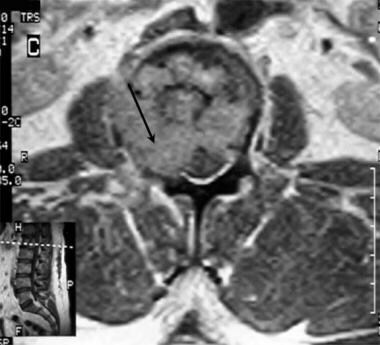 Sagittal reformatted CT image demonstrates fracture of the anterior L1 vertebral body with a posterior fragment displaced into the spinal canal (black arrow). The fracture extended into the spinous process (yellow arrow). 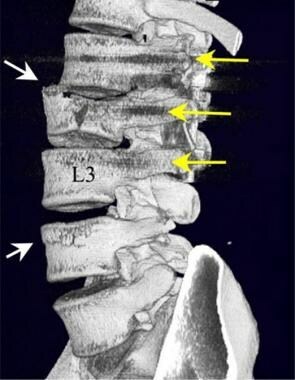 A second fracture in the L3 vertebral body is noted in the posterior aspect of the inferior endplate of the L3 (white arrow). Sagittal T2-weighted MRI of an L2 compression fracture. Relatively little deformity of the L2 vertebral body is shown, with less than 5° of kyphotic forward angulation. Compression fractures with little angulation often are associated with significant posterior ligamentous trauma (arrow). Lumbar spine trauma. 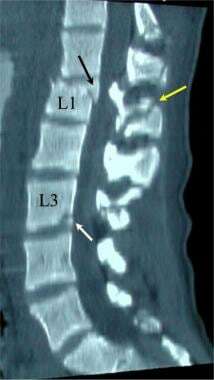 Two contiguous sagittal T2-weighted MRIs of the lumbar spine demonstrate a compression fracture of the L1 vertebral body. The anterior aspect of the L1 is compressed more than 60%. The posterior margin of the fracture encroaches into the spinal canal at the L1 level. The etiology for osteoporotic spinal fractures is most commonly related to age. Lumbar spinal fractures occur in children of all ages, and fractures in children are often associated with other serious injuries. The fracture patterns may involve more than one spinal level.1 Lumbar spinal fractures secondary to osteoporosis are more common in older women. 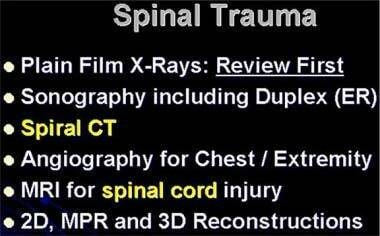 A general outline for the evaluation of acute multiple trauma involving the spine is shown below. Lumbar spine trauma. Imaging methods that may be useful in the evaluation of the patient with an acutely injured lumbar spine. Oblique views are useful if the AP and lateral views demonstrate scoliosis or a questionable defect of the posterior spinal elements. Flexion and extension views are helpful if subluxation is detected or if a chronic injury may be present. In patients with compression fracture, the anterior height of the vertebral body is diminished, whereas the posterior height generally remains within normal limits. No subluxation of vertebral bodies is present in a simple compression fracture. 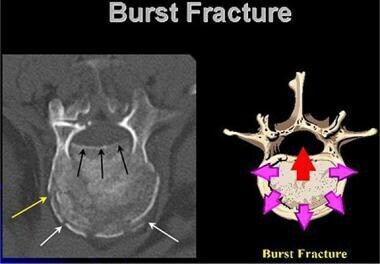 The anterior compression is less than 40% unless a burst fracture is present, as shown in the images below. Lumbar spine trauma. Lateral radiograph of an L2 fracture demonstrates a pattern of downward compression (yellow arrow) and anterior fracture fragment displacement (white arrow). After conventional radiography, CT is the primary means used to depict the posterior elements, which is necessary to exclude posterior instability and vertebral body deformity. CT scans are better in depicting the spinal canal and in estimating the degree of neural compromise. In a burst fracture, CT best demonstrates posterior spinal element involvement, as shown in the image below. Lumbar spine trauma. A 35-year-old man presented to the emergency department after a motor vehicle accident. He complained of back pain without paresthesias or weakness of his lower extremities. Axial CT image demonstrates a compression fracture of the upper lumbar spine. Note the comminuted fracture pattern. Axial CT scans fail to demonstrate subtle horizontally oriented injuries of the vertebral bodies, pedicles, or laminae. Also, axial CT scans may not depict minimal vertebral body compression fractures. The use of frontal and sagittal reformation, together with thin primary imaging sections, can overcome most of these limitations, as shown in the images below. Lumbar spine trauma. 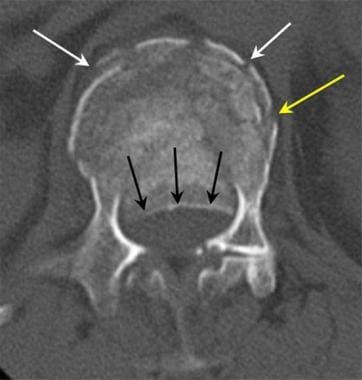 Sagittal multiplanar reformatted CT scan demonstrates a compression fracture of the L1 vertebral body (white arrow). A large fragment of bone projects into the spinal canal (yellow arrow). Many patients who present with lumbar spine injury have pulmonary, rib, or vascular injury. The expense and delay of obtaining routine CT scans of the lumbar spine are not justified. A review of the bone windows of thoracic and abdominal CT scans reveals most major deformities that are associated with Chance fracture, distraction injury, and burst vertebral fractures. More complex injuries can be studied later if necessary, but multisection CT studies can be reformatted to examine the lumbar spine in a lateral (sagittal) view. The use of MRI in spinal trauma should be linked to neurologic examination or unexplained severe spinal pain. MRIs of the lumbar spine provide information that is not available with CT scans. Early in an injury, T1-weighted spin-echo (SE) axial and sagittal images may demonstrate the high signal intensity related to acute hemorrhage, including the rare complicating epidural hemorrhage. Both T2-weighted fast spin-echo (FSE) and fluid-attenuated inversion recovery (FLAIR) images demonstrate the high signal intensity associated with edema of bone marrow fat. Gradient-echo T2-weighted images best outline the shape and structure of the vertebral body and the posterior spinal elements. These MRIs are superior to CT scans for the detection of a posttraumatic herniated disk, ligamentous edema, and spinal cord compression. Gadolinium diethylenetriamine pentaacetic acid (Gd-DTPA) contrast enhancement should be used in patients with suspected metastatic disease and septic spondylosis, diskitis, or osteomyelitis, as shown in the image below. Occult injury associated with lumbar vertebral body compression may be better assessed by using nuclear medicine bone scanning than with other techniques. Technetium-99m hydroxydimethylpyrimidine (HDP) is most commonly administered for this test. Chronic injuries demonstrate moderately increased activity, whereas acute fractures usually demonstrate a focally increased activity. Radiographs may not clearly demonstrate the posterior spine elements, and excluding a Chance fracture can be difficult. Lumbar spine radiographs demonstrate the general outline of the vertebral bodies, the interspaces, and some of the supporting soft tissues; however, lumbar radiographs do not demonstrate acute disk herniations or minimally displaced spinal fractures. Lumbar spine radiographs are very limited in the evaluation of obese patients because of x-ray beam attenuation and scatter. Axial CT scans may fail to depict subtle horizontally oriented injuries of the vertebral bodies, pedicles, or laminae. Axial CT scans also may miss minimal vertebral body compression fractures. The use of frontal and sagittal reformation, together with thin primary image sections, can overcome most of these limitations. The resolution of MRIs used in the detection of spinal fractures is limited. Although gradient-echo and T1-weighted SE images outline fractures better, minimally displaced fractures are difficult to see. Although nuclear medicine bone scans are sensitive to the processes that destroy or injure bone, a positive area of increased uptake on a bone scan is not specific for fracture. The fracture may not be detectable for as long as 72 hours after an injury. The resolution of fracture outlines is poor with nuclear medicine studies. Large osteophytes and intervertebral disk narrowing with vertebral endplate sclerosis may appear as areas of increased activity on standard nuclear bone scans. Standard radiographic views are AP, lateral, and oblique. AP radiographs are obtained with the patient supine. The patient's knees are flexed to reduce lumbar lordosis. The x-ray beam is directed toward the central abdomen over the umbilicus and the iliac crests. When a lateral lumbar radiograph is obtained, the patient lies on either side with the knees and hips flexed. The x-ray beam is directed toward the body of the L3 vertebral body. Radiographs in the oblique view are obtained with a 45° rotation, with the central beam directed toward the L3 vertebral body. Radiographic images of spinal traumatic injuries are shown below. Lumbar spine trauma. Anterior view of a Chance fracture of the L2 vertebral body. The fracture line follows a horizontal plane through the L2 vertebral body and the transverse processes (arrows). Lumbar spine trauma. Lateral radiograph demonstrates postoperative results after stabilization of an L1 compression fracture. Lumbar spine trauma. Lateral view of the lumbar spine demonstrates a compression fracture (arrow). Because the patient's pain was of recent onset, the fracture was considered to be acute. The loss of vertebral body height is less than 50%. The patient was considered to be a good candidate for treatment with vertebroplasty. Lumbar spine trauma. True lateral views of the lumbar spine during the performance of a vertebroplasty procedure. A, The needle is introduced through the pedicle into the area of compression within the vertebral body. B, The bone cement agent, mixed with radiopaque barium, is injected into the compression fracture. C, After successful injection of the cement, the needle is removed. Note that the bone cement now supports the superior aspect of the compression fracture (double arrow). In the AP view, the interpedicular distances are noted to increase from L1 to L5. On the lateral view, the vertebral body of L1 is often slightly anteriorly wedged without buckling of the anterior cortex or condensation of endplates. Soft tissue swelling may indicate a fracture even if the fracture is not directly visualized. Structures that are best seen on the oblique views include the transverse process and pedicle on the dependent side and the pars interarticularis. Burst fracture, which is one of the more serious injuries to the lumbar spine, is usually easily detected on standard radiographs of the lumbar spine. In the lateral view, criteria for instability include a greater than 50% loss of vertebral body height, a greater than 20° angulation of the thoracolumbar junction, neurologic injury, and a canal narrowing of greater than 30%. Early surgical repair is indicated for such an injury, because additional compression of the fracture and more severe neurologic injury can be expected if the patient attempts weight bearing without surgical fixation. The normal thoracolumbar spine junction has a 0° angle between the T12 and L1 levels. Another common injury pattern involves an avulsion injury to the transverse and/or spinous processes. Fractures of the lower lumbar transverse spinous processes associated with an unstable pelvic fracture may indicate injury to the sacral plexus. Fractures of transverse processes may be associated with visceral trauma as well. Oblique views of the lumbar spine are useful in the evaluation of spondylolysis of the pars interarticularis. The so-called Scottie dog configuration may demonstrate a defect in the "neck" of the dog-shaped configuration in patients with spondylolysis. In patients who have undergone operative repair of the spine, radiography is the modality most commonly used for postoperative imaging. CT and MRI may be useful postoperatively, but metal devices used for the repair may cause artifacts on MRI imaging. 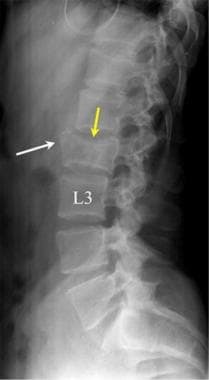 In patients with chronic pain or potential instability after surgical stabilization, standing flexion-extension lateral radiographs are useful for detecting spondylolisthesis. Flexion-extension maneuvers are well within the normal range of motion of most patients after spinal fusion. After the initial healing period of 12-24 weeks, moderate flexion-extension movements are safe. Instability and subluxation indicate a primary failure of the fusion surgery. All initial attempts to evaluate weight bearing should be monitored and limited by pain or the onset of neurologic complaints. Common false-positive signs of fracture in the lumbar region occur due to superimposed bowel gas and un-united secondary ossification centers. A limbus vertebra is a small accessory bone noted superior and anterior to the vertebral endplate; it is not associated with acute trauma. Unilateral sacralization of L5 may suggest a fracture on AP and oblique radiographs. The best interobserver agreement can be obtained by measuring from the superior endplate of the vertebral body one level above the injured vertebral body to the inferior endplate of the vertebral body one level below. False-positive findings can result from previous (chronic) kyphosis due to osteoporosis or prior injury. Kyphosis after trauma is best compared by using prior lateral radiographs if they are available. A common variant is the combination of spondylolisthesis and spondylolisthesis. Because of a defect in the pars interarticularis, anterior-posterior movement occurs along the plane of 2 related vertebral endplates. This is most common at the L5-S1 levels. Although the resulting deformity is considered to be a developmental defect, it may be mistaken for an acute injury pattern. 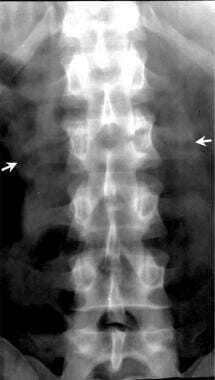 A false sign of spondylolysis may result from the wrong radiographic angulation. The oblique lateral view should be obtained by using a 15° cephalic angulation. Occasionally, severe degenerative disease of the facet joints will result in instability and a moderate spondylolisthesis; this pattern may also resemble acute injury. Traumatic injuries of the lumbar spine are displayed in the CT images below. Lumbar spine trauma. Drawing of the mechanism of injury of the lumbar spine burst injury is compared with an axial CT image. 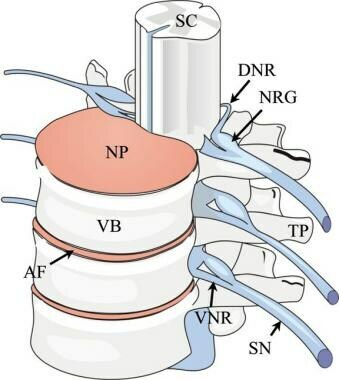 The centrally applied vertical force results in radial expansion of the vertebral body endplate. The posterior margin of the endplate may be displaced into the spinal canal (arrow). Lumbar spine trauma. Axial CT image in a patient with compression burst fracture of the lumbar spine. 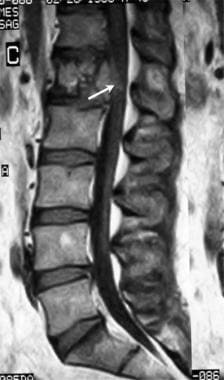 The posterior margin of the compression burst fracture is displaced into the spinal canal (black arrows). The anterior margin of the vertebral body is fractured, with a pattern of compression (white arrows), while a transverse fracture extends from the anterior to the lateral margin of the vertebral endplate (yellow arrow). Lumbar spine trauma. 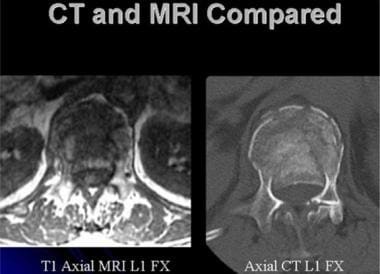 Axial CT (right) and axial MRI (left) images of an upper lumbar spine burst injury. While the CT image presents better detail concerning the bone injury, the MRI image fully illustrates the position of the conus. 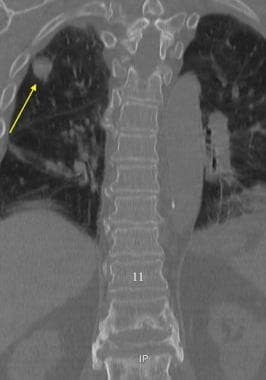 Coronal CT of the Thoracic and Upper Lumber Spine.The compression of the first lumbar vertebral body is associated with lateral displacement of the vertebral margins. The presence of a right upper lobe lung nodule is indicated by the arrow. CT images of the spine should be reviewed using both the wide field and collimated images. Lumbar spine trauma. 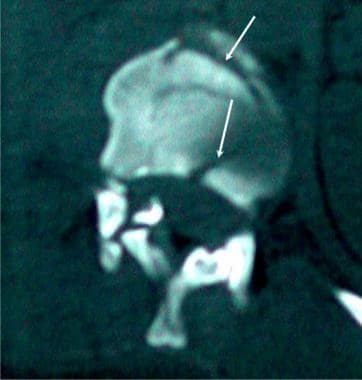 Sagittal reformatted CT image in a patient with lumbar vertebral body distraction (arrow). Distraction injury commonly is associated with injury to the conus of the distal spinal cord. Lumbar spine trauma. Three-dimensional reconstruction of a CT scan of the thoracic and lumbar spine in a patient with complex injury. The L1 vertebral body is compressed with a severe rotation of the L1 vertebral body under the T12. This injury was associated with a severe neurologic injury to the conus and cauda equina. Lumbar spine trauma. Axial CT images of an L2 compression burst fracture after posterior fusion with pedicle screws (yellow arrow) joined by a posterior bar (white arrow). The pedicle screws should be entirely within the bone of the body and pedicle of the vertebral bodies. Lumbar spine trauma. Axial CT image after a lumbar myelogram. Contrast material is noted in the posterior paraspinal region outside of the thecal sac (yellow arrows). The pedicle screws were noted to follow a satisfactory course within the pedicles of the L4 and L5 vertebral bodies. The dural leak was later successfully repaired. SC indicates the spinal canal. Lumbar spine trauma. Oblique view of 3-dimensional reconstruction of a multisection CT scan of the lumbar spine after posterior fusion of an L2 burst fracture. Note the fractures of the L2 vertebral body and the anterior endplate of the L4 body (white arrows). Pedicle screws have been placed in the L1, L2, and L3 (yellow arrows) vertebral bodies. By using multisection CT scanning, artifacts related to the pedicle screws are kept to a minimum. Lumbar spine trauma. 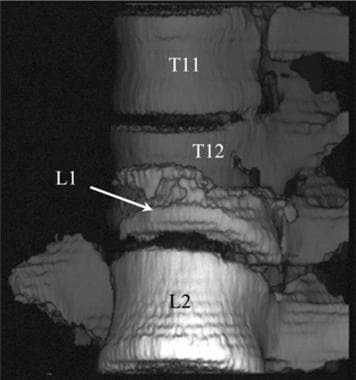 Sagittal 3-dimensional surface model of a CT scan of the lumbar spine after transpedicular fixation of the L4-5 interspace. Although the pedicle screws are in a satisfactory position within the pedicles of L4 and L5, a leak is present in the dura. 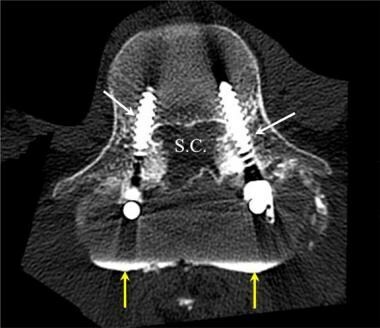 Contrast material from an intrathecal injection has collected in the extradural space (arrows). Dural repair was later successful. Lumbar spine trauma. Sagittal 3-dimensional and multiplanar reformatted CT images of a fixation of the thoracic-lumbar junction. A bone graft and fixation plate have been positioned across the T11-T12-L1 levels. Good-quality CT images can be used to identify more lumbar spine injuries than conventional radiographic studies; however, the percentage of clinically important spinal fractures seen in the lumbar region on CT scans and not seen on radiographs is lower than that of similar studies of cervical spinal fractures. Most of the fractures missed on radiographs are spinous process fractures, transverse process fractures, and fractures in large patients. With the introduction of multisection CT scanners, a careful evaluation of the lumbar spine is possible in all patients without performing a specific examination tailored to the lumbar area. In general, the appearance of fractures on CT scans demonstrates injuries similar to those on radiographs of the lumbar spine. As a result of its superior contrast definition and the absence of superimposed structures, CT imaging of the spine is highly effective and accurate in the diagnosis of fractures. The confidence level for the diagnosis of a lumbar spine fracture with 2-mm axial sections (possible with a multisection CT unit) is greater than 98% and has been reported to be 99%. Because axial CT is performed with patients in a neutral position, bony distraction of the fracture fragments and subluxations of the spinal articulations may not be as significant on CT images as on an acute trauma series of radiographs. The level of a burst fracture and the percentage of spinal canal stenosis have been correlated with an associated neurologic deficit. A significant correlation exists between neurologic deficit and the percentage of spinal canal stenosis. Injuries to the T12 and L1 spine pose a greater probability of neurologic deficit. This observation may be related to the smaller canal diameter in the thoracic-lumbar spinal junction. The severity of neurologic deficit cannot be predicted. Associated injuries, including acute lumbar disk herniations, are usually well depicted on CT scans of the lumbar spine. Paravertebral bleeding and the presence of foreign bodies are also easily detected by using CT. In addition to other acute spinal and visceral injuries, the application of whole body CT in the setting of acute trauma may discover other unrelated serious medical conditions. 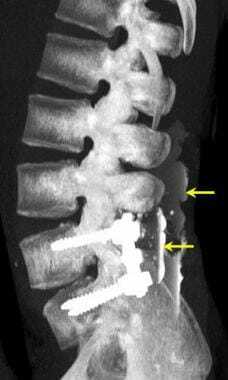 The confidence level for the diagnosis of a lumbar spine fracture with 2-mm axial sections (which is possible with a multisection CT unit) is reportedly 99%. 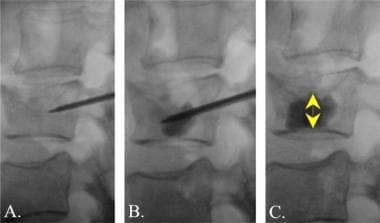 When present, traumatic lumbar spine disk herniations are detected in 85-92% of cases. Because axial CT is performed with the patient in a neutral position, bony distraction of the fracture fragments and subluxations of the spinal articulations may not be as significant on CT images as on acute trauma series radiographs. False-positive results may occur in patients with a Schmorl node, which is a chronic internal herniation of the vertebral disk into the lumbar vertebral body endplate and failure of the fusion of the anterior vertebral endplate epiphysis. False-negative CT studies may occur in chronic stress injury and severe generalized osteoporotic endplate fractures. A posttraumatic disk herniation may be undetected in large patients and in patients who have undergone prior lumbar spine surgery. Lumbar spine traumatic injuries are displayed in the magnetic resonance images below. Lumbar spine trauma. 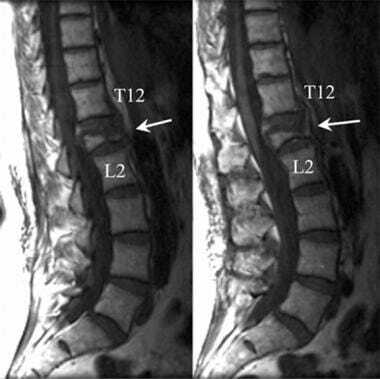 Sagittal T2-weighted gradient-echo MRI demonstrates a compression fracture of the L1 vertebral body with a small bony fragment displaced into the spinal canal. Lumbar spine trauma. Axial T1-weighted MRI in a patient with lumbar spine compression burst injury. 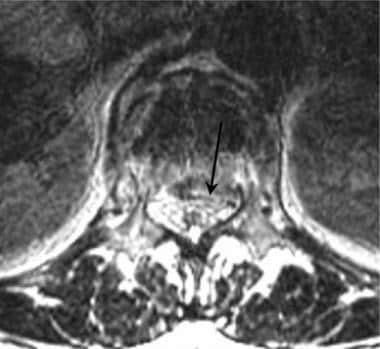 A comminuted fracture of the lumbar spine endplate (arrow) results in spinal canal narrowing. Lumbar spine trauma. 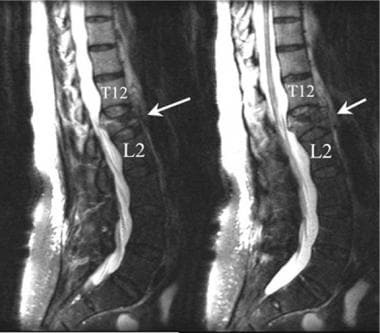 Axial T2-weighted MRI image in a patient with a burst fracture injury to the upper lumbar spine. The posterior margin of the vertebral endplate has been displaced into the spinal canal (arrow). Cerebrospinal fluid is seen as bright signal anterior to the conus and upper cauda equina. Lumbar spine trauma. A 35-year-old man presented to the emergency department after a motor vehicle accident. He complained of back pain without paresthesias or weakness of his lower extremities. 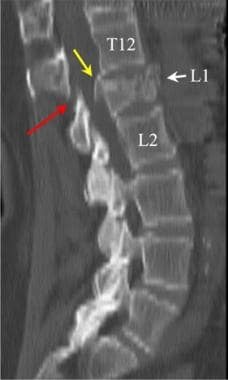 Findings on the sagittal T2-weighted MRI confirms edema in the posterior L1 vertebral body (white arrow), while stenosis is noted posterior and inferior to the L1 (yellow arrow). Sagittal FSE T2 weighted MRI of the lumbar spine. 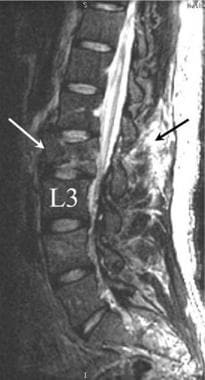 The chronic lower back pain experienced by this middle-aged man is associated with marked compression of L1. Notice the retropulsion of the posterior margin of the first lumbar vertebral body against the conus (arrow). Lumbar spine trauma. 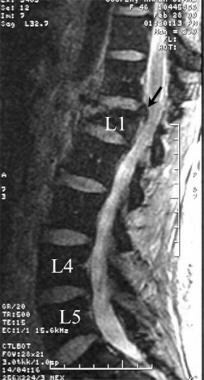 Sagittal T1-weighted MRI of the lumbar spine demonstrates a severe degree of compression of the L1 vertebral body (arrow). More than 60% of the vertical height of the L1 has been lost due to a compression failure of the L1 body. Lumbar spine trauma. Sagittal T1-weighted MRI of the lumbar spine. A 40-year-old man without any preceding event presented with sudden severe low back pain after lifting at work. He underwent chiropractic manipulation without relief of pain. The pain radiated into his right thigh. Lumbar spine findings were abnormal, and additional studies were performed. Lumbar spine trauma. 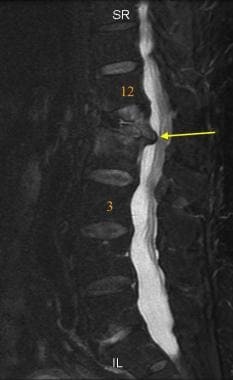 Axial T1-weighted MRI of the lumbar spine in a 40-year-old man without any preceding event who presented with sudden severe low back pain after lifting at work. The patient underwent chiropractic manipulation without relief of pain. The pain radiated into his right thigh. Lumbar spine findings were abnormal, and additional studies were performed. 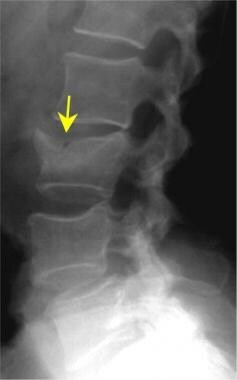 The results confirm narrowing of the right side of the spinal canal (arrow) due to pathologic fracture. Lumbar spine MRIs can demonstrate many vertebral fractures and most abnormalities of alignment. The patterns of injury are similar to those demonstrated on radiographs. MRI is superior to both radiography and CT in the detection of soft tissue injury to the ligaments, facet capsules, and the prevertebral spaces. MRI is unique in its ability to detect epidural bleeding and spinal cord injury. Injury to the lower thoracic cord is particularly critical because such injury may result in paralysis. However, MRI has fewer line pairs of resolution than does CT, which makes MRI a secondary method for fracture evaluation. Gradient-echo sagittal T2-weighted MRI of the spine demonstrates compression fractures by showing the cortical bone as dark (black), whereas the T2-weighted quality shows cerebrospinal fluid and spinal cord edema as bright (white). Subacute hemorrhage in the spinal cord or in the epidural space may be seen as a susceptibility area of lost signal intensity. With a T2-weighted gradient-echo technique, the cortical break can be demonstrated in some fractures. MRI is superior to CT in the identification of the indirect signs of a fracture, such as paraspinal edema or hemorrhage, epidural bleeding, and sprains of the paraspinal and intraspinal ligaments. 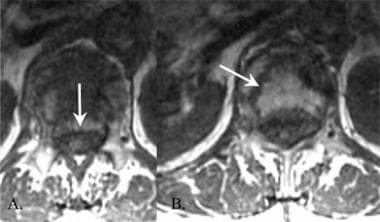 Paraspinal soft tissue injury and posttraumatic disk herniation are best depicted by using MRI. Lumbar spine MRIs can demonstrate many vertebral fractures and most abnormalities of alignment. MRI is superior to CT in the identification of indirect signs of a fracture such as precervical edema or hemorrhage, epidural bleeding, and sprains of the paraspinal and intraspinal ligaments. Associated injuries to intracranial structures are evaluated better by using MRIs than by using CT images. False-positive MRI results are often associated with movement artifacts of metal near the site of injury. Blood vessel canals may mimic bone injury. The use of upper cervical and intracranial MRA may help idifferentiate certain vascular variations. False-negative findings may result from motion on the part of the patient. Artifacts related to implanted metal may mask spinal fractures. In older patients or in patients with known neoplastic disease, a pathologic fracture should be considered. In these patients, MRI with Gd-DTPA enhancement can demonstrate a spinal mass or osteomyelitis. MRI has a lower overall resolution than that of CT scanning. With T2-weighted gradient-echo sequences, the cortical break can be demonstrated in some fractures; however, even with adequate MRI technique, minimally displaced fracture lines may not be visible on MRI. Patients who underwent prior lumbar surgery should be examined after the intravenous injection of contrast agent to differentiate between an epidural scar and a recurrent herniated nucleus pulposus. The use of paraspinal ultrasonography is usually limited to the localization of pleural effusions, which may occur after significant upper lumbar spine and chest wall injury. In selected patients, ultrasound may localize paraspinal abscesses prior to aspiration. Because of the proximity of the kidneys and ureters to the lumbar spine, the sonographic findings may indicate perinephric hemorrhage or urinary obstruction. The primary findings of soft tissue swelling and possible hemorrhage are not specific to lumbar trauma. Masses, urinary leaks, and perispinal abscess may have sonographic findings similar to those of paraspinal hemorrhage. Nuclear medicine studies have a limited role in the acute phase of lumbar spine injury; however, in patients with a possible congenital anomaly, these studies can differentiate an acute fracture from failure of an epiphyseal endplate to fuse. After 24 hours, a bone scan obtained by using technetium-99m HDP generally demonstrates increased uptake in the area of a fracture. A delay of as long as 72 hours may be necessary to identify some fractures. Later in the clinical course, persistent back pain may be caused by a nondisplaced facet injury or pedicle fracture, which is also associated with an area of increased uptake. After surgery or in open spinal fractures, diskitis and osteomyelitis can be identified as focal areas of increased activity by using 99m Tc HDP or gallium-67 citrate. Indium-111–tagged white blood cells act as a more specific agent in the detection of abscess and osteomyelitis; however, the sensitivity of this method depends on the nature of the infectious organism. In the absence of prior surgery, radionuclear bone imaging is fairly sensitive but not specific for spinal trauma. If bone scans are needed, single-photon emission computed tomography (SPECT) imaging should be used in all patients with suspected spinal trauma. The presence of fixation plates, wires, and screws makes the assessment of postoperative spinal injury difficult. In all patients, the tomographic qualities of SPECT improve both the accuracy and specificity. Many false-positive findings can be expected in older adults. Osteomyelitis, diskitis, metastatic disease, degenerative spondylosis, rheumatoid arthritis, and ankylosing spondylitis may result in abnormal findings in the spine that are not directly related to acute trauma. In the young child, variations of spinal development may mimic acute injury. False-negative results may occur in the first hours after acute trauma. If possible, 72 hours should be allowed to pass before attempting nuclear bone scan of the lumbar spine. Also, false-negative results are fairly common with In-111 WBC scans, and an approach involving a combined bone-gallium scan is preferred. Angiography plays a limited and indirect but critical role in assessing lumbar spine injury. After a gunshot wound to the back, injuries to the aorta and the proximal great vessels are best evaluated by using angiography. Flank pain may be the result of bleeding or hydronephrosis. New higher-resolution CT angiography makes catheter angiography less essential. The evaluation of injury to the major vessels is routinely performed during the assessment of patients with multisystemic trauma. The higher resolution of digital subtraction angiography results in excellent image quality. Rarely are other vascular images necessary. Angiography typically is reserved for possible interventional repair of arterial injuries and for patients in whom the diagnosis is uncertain. Standing waves may mimic vascular injury with spasm. In the older adult, arteriosclerotic vascular disease may mimic spasm. Lumbar arteries may be in spasm at the time of an examination, preventing localization of a bleeding site. Rush JK, Kelly DM, Astur N, Creek A, Dawkins R, Younas S, et al. Associated injuries in children and adolescents with spinal trauma. J Pediatr Orthop. 2013 Jun. 33(4):393-7. [Medline]. Mazziotti G, Bianchi A, Porcelli T, Mormando M, Maffezzoni F, Cristiano A, et al. Vertebral fractures in patients with acromegaly: a 3-year prospective study. J Clin Endocrinol Metab. 2013 Aug. 98(8):3402-10. [Medline]. Mandel S, Schilling J, Peterson E, Rao DS, Sanders W. A retrospective analysis of vertebral body fractures following epidural steroid injections. J Bone Joint Surg Am. 2013 Jun 5. 95(11):961-4. [Medline]. Abdelrahman H, Siam AE, Shawky A, Ezzati A, Boehm H. Infection after vertebroplasty or kyphoplasty. A series of nine cases and review of literature. Spine J. 2013 Jul 20. [Medline]. Athanasakopoulos M, Mavrogenis AF, Triantafyllopoulos G, Koufos S, Pneumaticos SG. 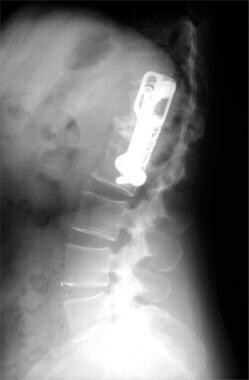 Posterior spinal fusion using pedicle screws. Orthopedics. 2013 Jul 1. 36(7):e951-7. [Medline]. Cheng LM, Wang JJ, Zeng ZL, Zhu R, Yu Y, Li C, et al. Pedicle screw fixation for traumatic fractures of the thoracic and lumbar spine. Cochrane Database Syst Rev. 2013 May 31. 5:CD009073. [Medline]. Tamir E, Anekstein Y, Mirovsky Y, Heim M, Dudkiewicz I. Thoracic and lumbar spine radiographs for walking trauma patients--is it necessary?. J Emerg Med. 2006 Nov. 31(4):403-5. [Medline]. Dai LY, Wang XY, Jiang LS, Jiang SD, Xu HZ. Plain radiography versus computed tomography scans in the diagnosis and management of thoracolumbar burst fractures. Spine. 2008 Jul 15. 33(16):E548-52. [Medline]. Burns JE, Yao J, Muñoz H, Summers RM. Automated Detection, Localization, and Classification of Traumatic Vertebral Body Fractures in the Thoracic and Lumbar Spine at CT. Radiology. 2016 Jan. 278 (1):64-73. [Medline]. [Full Text]. Petritsch B, Kosmala A, Weng AM, Krauss B, Heidemeier A, Wagner R, et al. Vertebral Compression Fractures: Third-Generation Dual-Energy CT for Detection of Bone Marrow Edema at Visual and Quantitative Analyses. Radiology. 2017 Jul. 284 (1):161-168. [Medline]. [Full Text]. Yang P, Wu G, Chang X. Diagnostic accuracy of dual-energy computed tomography in bone marrow edema with vertebral compression fractures: A meta-analysis. Eur J Radiol. 2018 Feb. 99:124-129. [Medline]. Bredella MA, Essary B, Torriani M, Ouellette HA, Palmer WE. Use of FDG-PET in differentiating benign from malignant compression fractures. Skeletal Radiol. 2008 May. 37(5):405-13. [Medline]. [Full Text]. Rutherford EE, Tarplett LJ, Davies EM, Harley JM, King LJ. Lumbar spine fusion and stabilization: hardware, techniques, and imaging appearances. Radiographics. 2007 Nov-Dec. 27(6):1737-49. [Medline]. [Full Text]. [Guideline] Deunk J, Brink M, Dekker HM, Kool DR, van Kuijk C, Blickman JG, et al. Routine versus selective computed tomography of the abdomen, pelvis, and lumbar spine in blunt trauma: a prospective evaluation. J Trauma. 2009 Apr. 66 (4):1108-17. [Medline]. Gross EA. Computed tomographic screening for thoracic and lumbar fractures: is spine reformatting necessary?. Am J Emerg Med. 2010 Jan. 28(1):73-5. [Medline]. Barrett TW, Schierling M, Zhou C, Colfax JD, Russ S, Conatser P, et al. Prevalence of incidental findings in trauma patients detected by computed tomography imaging. Am J Emerg Med. May/2009. 27(4):428-35. [Medline]. [Guideline] Dai LY, Ding WG, Wang XY, Jiang LS, Jiang SD, Xu HZ. Assessment of ligamentous injury in patients with thoracolumbar burst fractures using MRI. J Trauma. June, 2009. 66(6):1610-5. [Medline]. Semaan HB, Bieszczad JE, Obri T, Aldinger PK, Bazerbashi MF, Al-Natour MS, et al. 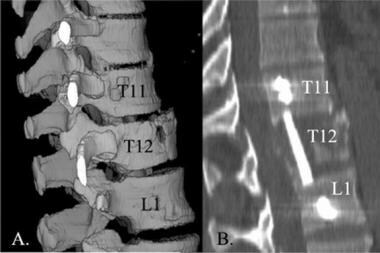 Incidental Extraspinal Findings at Lumbar Spine Magnetic Resonance Imaging: A Retrospective Study. Spine (Phila Pa 1976). 2015 Sep 15. 40 (18):1436-43. [Medline]. Neufeld EA, Shen PY, Nidecker AE, Runner G, Bateni C, Tse G, et al. MR Imaging of the Lumbosacral Plexus: A Review of Techniques and Pathologies. J Neuroimaging. 2015 Sep. 25 (5):691-703. [Medline]. Schellinger D, Lin CS, Hatipoglu HG. Potential value of vertebral proton MR spectroscopy in determining bone weakness. AJNR Am J Neuroradiol. 2001 Sep. 22(8):1620-7. [Medline]. Hanson EH, Mishra RK, Chang DS, Perkins TG, Bonifield DR, Tandy RD, et al. Sagittal whole-spine magnetic resonance imaging in 750 consecutive outpatients: accurate determination of the number of lumbar vertebral bodies. J Neurosurg Spine. 2010 Jan. 12(1):47-55. [Medline]. Lumbar spine trauma. The normal lumbar spine consists of 5 vertebral bodies that are fully articulated and without associated ribs. The anterior lumbar vertebral bodies are slightly greater in vertical height than the posterior body, which results in a natural lordotic curve of the lower back.The last thoracic vertebral body (T12) has a rib facet. The first sacral segment (S1) is usually not fully articulated. The sacral joint (SJ) lies lateral to the sacrum. Lumbar spine trauma. Lateral drawing of a lumbar vertebral body. The vertebral bodies of the lumbar spine are larger and thicker than those of the thoracic spine. The facet joints of the lumbar spine are oriented in a more anterior-posterior plane than those of the thoracic spine. Lumbar spine trauma. Drawing of 2 lumbar segments viewed from an oblique angle. The outline of the facets and the pars interarticularis have the appearance of the "neck" of a Scottie dog. Lumbar spine trauma. The structures of the lumbar spine can be considered as 3 columns. Trauma to the lumbar spine may result in injury limited to the anterior, middle, or posterior column, or it may involve multiple spinal columns, resulting in gross instability. Lumbar spine trauma. Lateral drawing of the 3 spinal columns of the thoracolumbar junction. The anterior column (black dotted line) includes the anterior spinal ligament, the anterior annulus fibrosis, the intervertebral disc, and the anterior two thirds of the vertebral bodies. The middle column (red dotted line) includes the posterior aspect of the vertebral bodies, the posterior annulus fibrosis, and the posterior longitudinal ligament. The posterior column (thick blue dotted line) includes all of the spine posterior to the longitudinal ligament (thick blue dotted line). Lumbar spine trauma. 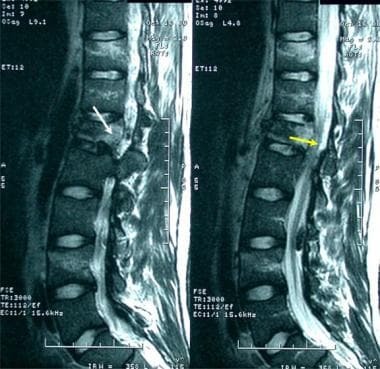 A Chance fracture or a modified compression fracture of the upper lumbar spine may occur when the weight of the upper body moves forward (red arrow) while the person's waist and upper body are fixed in position by the seatbelt or steering wheel of an automobile (pink arrows). The resulting fixed-position stress results in a fracture. Lumbar spine trauma. Drawing of a Chance fracture of the thoracolumbar junction. The defect follows an irregular horizontal plane (arrows), which results in disruption of the anterior (black dotted line), the middle column (red dotted line), and the posterior column (blue dotted line). Lumbar spine trauma. Drawing of the primary force involved in compression burst injury of the lumbar spine. The vertical force is directed into the central portion of the lumbar endplate (arrow). The force results in both downward and axial displacement of fragments of the vertebral body endplate. Lumbar spine trauma. Sagittal view of a multiplanar reformatted image of the lumbar spine. Spinal compression fractures are identified at the L2 and L5 levels. The vertical forces (arrows) have resulted in posterior displacement of a bone fragment into the spinal canal at the L2 vertebral body. As a result of a single traumatic event, compression fractures of the L2 and L5 have occurred. Lumbar spine trauma. Coronal view of a multiplanar reformatted image of the lumbar spine. Spinal compression fractures are identified at the L2 and L5 levels. The vertical forces (yellow arrows) have resulted in posterior displacement of a bone fragment into the spinal canal at the L2 vertebral body. As a result of a single traumatic event, compression fractures of the L2 and L5 have occurred. The coronal multiplanar reformatted image demonstrates more completely the vertical nature of the fracture patterns of the L2 and L5 (yellow arrows).